primaERP BILLING offers a range of functions and tools that were made with an emphasis on simplicity, intuitive work and productivity. 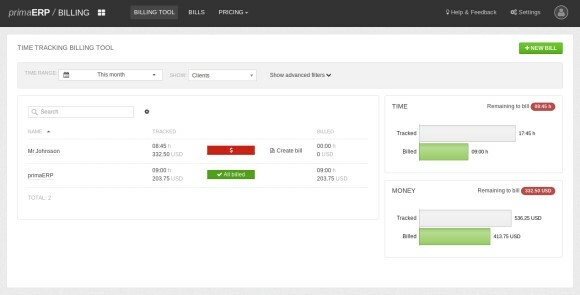 It gives you a straightforward and clear overview of the way your time is structured from a billed status point of view: you can not only create and manage your bills, but also see how the time you tracked in TIME TRACKING flows and transforms itself into money and manage your billing process. 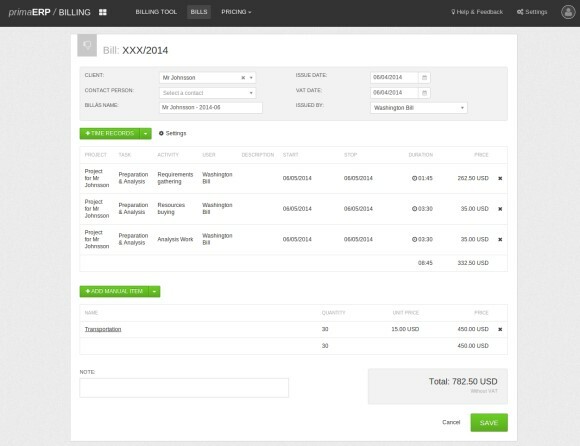 The Billing dashboard is the first thing you’ll see when starting the BILLING application. It’s convenient and the key to help you see your time structured according to its tracked and billed status. You can easily filter the time you’re interested in (by client, project, task, etc.) and have a quick feedback on how you’re doing from a project or client point of view. Taking a closer look at a zoomed version of the previous screenshot, you can confirm that although you’ve billed all your time for your client primaERP, you still have 08:45 hrs left to bill for Mr Johnsson. The graphs on the right will always show you the aggregated data based on the setup of your filters. How to create a new bill? You have two different ways of creating a bill. You can either do it via the dashboard or via the bills section. In the dashboard, you can just click on the “Create bill” button and make your bill based on the data you’ve filtered and in the bills section, you can just click the “+New Bill” button. You will then open to the bill (see picture below), where you can fill in all necessary details. You can add time records, which are taken from primaERP TIME TRACKING by hitting the “+ TIME RECORDS” button. If you don’t want to add those time records, there’s an option of adding your own items, a thing we call “Manual Items”. The process is very straightforward: just hit the “+ ADD MANUAL ITEM” button and you could be adding fixed or custom expenses that are not present in your time records data but will be billed to your client. The possibilities are endless. Once you’re done building your bill, you can just save it, print it and you’re ready to send it to your client. All your bills are to be found in the list under the “Bills” menu. As soon as they are approved by the client, you can simply go and set their status as such by clicking on the little “thumbs up” in the corner (and in this way, mark it as complete). Please note: Once a bill is saved, the time records are automatically marked as billed.